Bangkok, Thailand was part of my first tour in Asia, when I was just 24 years old. From what I can remember of that trip, the hotel we stayed in, was super posh. High columns, gold gilding everywhere, rooms that seemed so nice, they even had a mini-bar. I was very young and had never experienced the luxury of these things, anywhere in the world. Part of that itinerary included stops in Hong Kong and Seoul, Korea before landing in the kingdom of Thailand. So this was a big deal for me. It was a long business trip by any standard. I think it was a full 10 days. The team I started with decided to head back to New York, leaving me in Bangkok to sort things out with our trading agent and some late arriving fed ex boxes. I was on my own for the last few days. That was quite a bit of explaining, just to set the stage and give some context for what happened next. Also, to describe the mixed feelings I have for Bangkok. Why I almost nixed this stop from our travel year schedule altogether. Back to 1994, my first big journey into South East Asia. Let me also mention, I was blown away. By all of it. 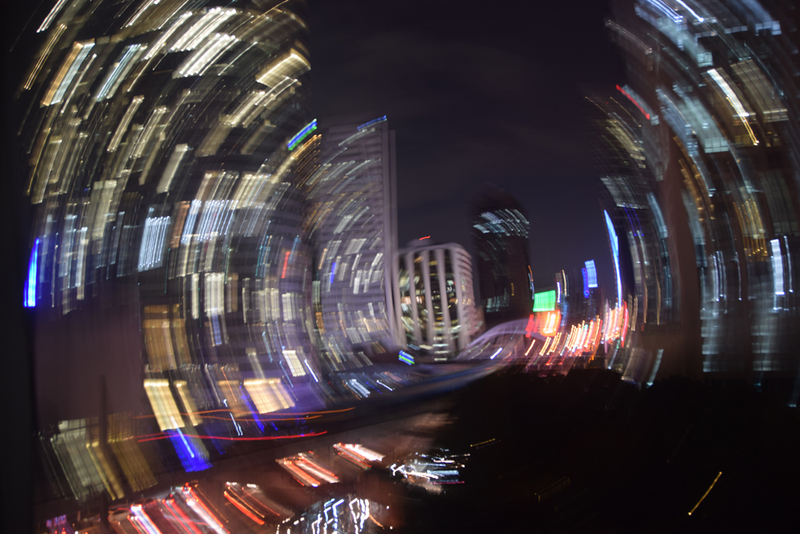 Bangkok has more energy than New York, the city I thought never slept. The heat is intense, but at this time of year, not oppressive. In the daytime, there is a scent in the air, but not a stench. It is almost a sweet perfume, maybe from some of the nearby flowering plants. There is poverty, opulence, and polite bows of greeting everywhere you turn. It is over the top, amazing and overwhelming at the same time. Towards the end of my first big business trip, some 23 years ago, I was feeling a little homesick, somewhat lonely and maybe a little run down. I was trying to do the right thing. No eating street food. No ice cubes in my drinks. Brushing my teeth in bottled water. Following all the advice. What I had not factored for was the bottled water in my swanky hotel might have been local. (Long before local was a good thing!) The bottles were this lovely Thai designed glass with regular screw cap tops. The color of the beautiful bottles made it hard to tell if the liquid inside was perfectly clear, or not. I just uncapped them and drank, as if it were a one litre beer. Needless to say, the fever, stomach cramps and diarrhoea didn’t hit me until I was leaving Hong Kong, my connection point, heading back to New York. I was more sick than I knew it was possible to be. Whatever illness was raging in my stomach, was made worse by the long haul flight. I felt so miserable, I wanted to die. I wished the plane to crash, as strange as that sounds now. I finally got home and went to bed. 3 days later I was able to go back to work. Who knows what type of stomach bug took me down. No-one really thought about or talked about seeing a travel clinic and getting vaccinations. And it may have just been travellers diarrhea. However, after that episode, I got a Twinrix shot for hepatitis A and B. Something which was not part of my childhood vaccination schedule. Maybe that would have made a difference back in Thailand. It would be at least a decade before I made my next trip to Bangkok. Much had changed by that time. I was older and wiser, not so easily impressed by the bright lights of the big city. I was leery, stepping up my vigilance for cleanliness and care for what I was consuming. I managed to enjoy the city and not get sick, not even a whisper of a stomach bug. I was one for two. Now, I like to think I have grown into a responsible adult. In accordance with that estimation, and when we decided to make Bangkok our entry point into a 3 month stay in South East Asia, I knew we had to be careful. I wouldn’t wish my experience on an enemy, let alone my children or husband! Therefore, I insisted on the full consult at the travel clinic. As per my last post on this topic, this service can be had at London Drugs now. A lot of progress since my first days of far east travel. However, you can’t get everything in Canada. Japanese Encephalitis was missing from our protocol. We planned to get that in Bangkok. Given my history with the city, it took a leap of faith to not only agree to the delay, but also to have the treatment in Bangkok of all places! While my fear may have been justified, at one time, I realized it was an outdated thought. Back in the 1990’s many multinational corporations began to locate their regional headquarters in Bangkok. It is now an international hub for transportation and health care. Bangkok kept coming up in searches for flights, as the stopover connection point for airlines. Often, emergency medical care that can’t be had in some of the neighbouring countries, requires transit to Bangkok for treatment. 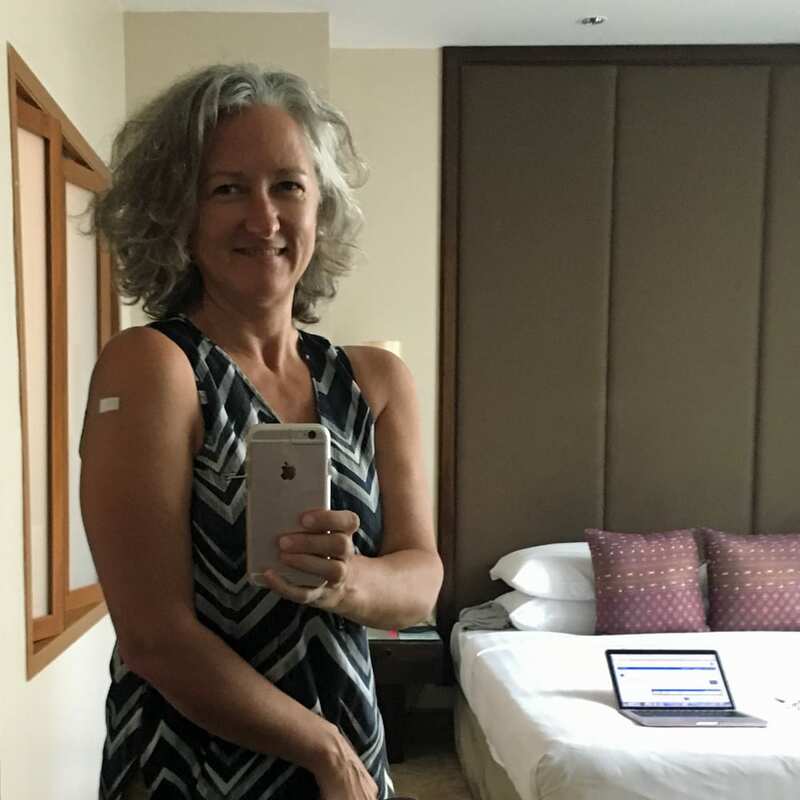 As for the vaccination process in Bangkok, I can’t recommend the experience highly enough. In our case, we received a vaccine, highly targeted to this region where the disease is endemic. Something which is priceless. Back home in Canada, the best they could offer us had low efficacy and at a high cost, it made no sense whatsoever. There doesn’t seem to be a lot of information online about this, so I feel compelled to explain where we went. The Thai Travel Clinic, is easily located in Bangkok near the victory monument and corresponding mass transit station. The clinic offers an appointment service for travellers where you can get your consultation, doctor meeting, vaccine and after treatment monitoring, in less than 2 hours. All that for $25 CAD per head. Not to mention the excellent instructions translated into the Thai language for taxi drivers and a 10 step walking photo tour of how to get into the right building, on the right floor and the right office space. Quite honestly, this was an easier process than many I have had in hospitals in Canada. So my relationship to Bangkok has changed. I don’t shudder and remember my episode with every bite of food, wondering if I’m going down again. I’ll take what comes, but I’m not going to cower in fear. If I am lucky, maybe my past exposure has allowed my body to build up immunity. Or maybe the water system is safer than it used to be. 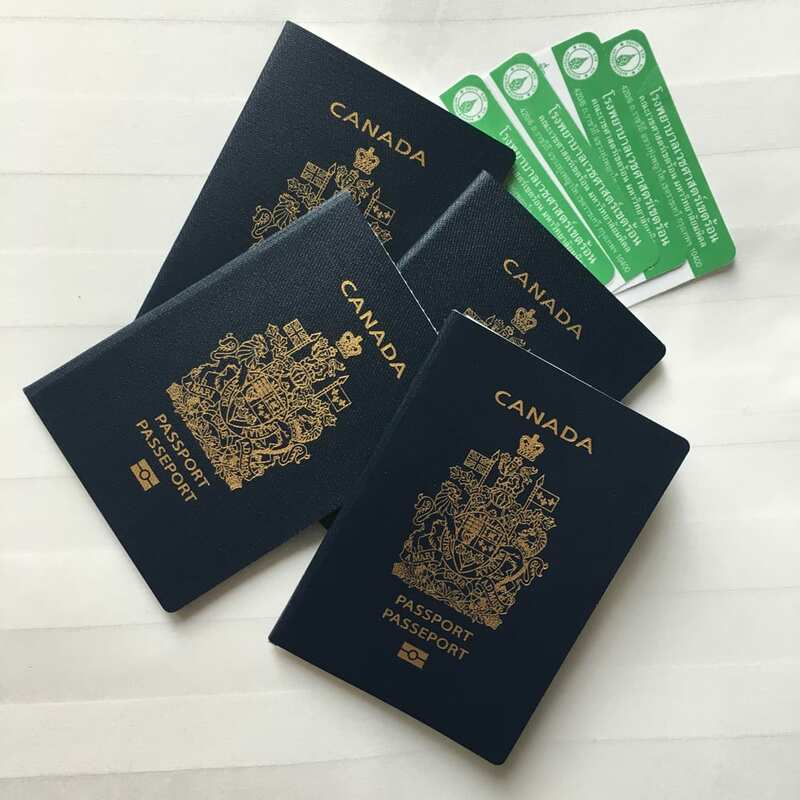 We now have our green hospital cards and hope to not be needing them again on this trip. The added benefit of being older and wiser was that I got to plan everything this time around. So I went a little over budget and got us a really nice serviced apartment. 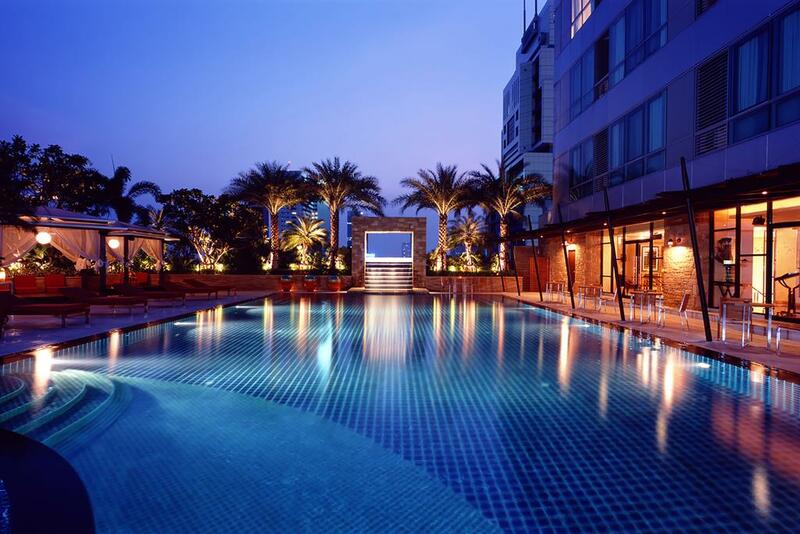 We are staying at the Ascott Sathorn Bangkok. From the moment we drove up in the taxi, there was oohs and ahhs from my kids. At one point, on the floor with the pool, I think Hailey exclaimed that the view was ‘stunning’. You get one shot to make a first impression and I think I blew them away, as I once was myself, many years ago. I would also like to add that we found a piece of home, here in Bangkok. A grocery store full of imported International stuff. As well as lots of local produce and meats. This place is catering to homesick expats and travellers like us. It is a bit of a walk on the wild side, down dark narrow alley ways to find it, but thank-you google, we managed. How comforting it was to walk up and down the aisles and recognize cereal, peanut butter and syrup. The store is even offering a Thanksgiving dinner, cooked and ready to go for the Americans here for the holidays. They were already playing Christmas music. It was so nice to be home, in spirit, even for just a few moments. Hailey said it best, commenting that she didn’t realize how much we take our home for granted. We did the same in Barcelona. We were there long enough to start complaining, like a local might do. Then we left, and now we miss it. And so it goes. We will miss Bangkok for a host of other reasons, once we move on. Join me in this creative journey. I think it will be worth your time. I look forward to hearing from you! Use any form of communication which feels comfortable. Email, social media or even, if you want to give me a call, I can reached at cwestermark on Skype. Together, let us see where we can take this. : : Why do people stare when I knit in public? : : We are a Canadian family, on a year-long trip, planning on 32 cities, 18 countries over 4 continents. : : Dad is working in Europe and Asia, Teens are doing distance education for grades 11 and 9, Mom is keeping it all together, writing, taking photos and making videos. : : Join me, Christine on a quest for a creative life, everyday. : : Subscribe to my youtube channel and don’t miss new posts on this blog Daily Creatives!